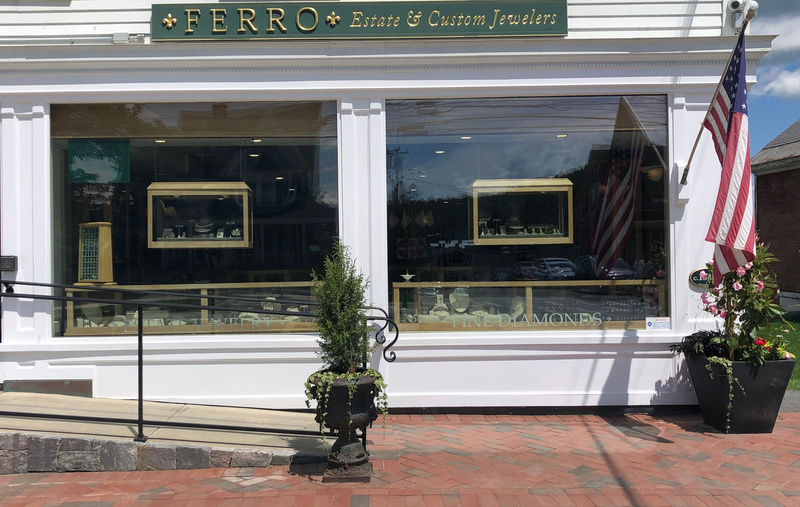 Created in our Woodstock, Vermont location, this Art Deco inspired engagement ring is custom made by Ferro Jewelers to your specifications. Shown in platinum, this piece is set with a .76ct. center diamond with .20ctw. of side diamonds. This unique and eye catching ring was crafted by Ferro Jewelers. The warm tones of 14kt rose gold pair well with the lovely white diamonds of this piece. The .49ct center diamond is hugged by a channel of rose gold on two sides, leaving the rest of the diamond open to catch the light. Bead set into the band on each side of the center stone are eight full cut diamonds that sparkle in any lighting. This vintage styled 14K white gold engagement ring has a center cluster oval and is accented with round cut diamonds for a dramatic effect. Four diamond center totals .61cttw. Great value for a timeless look. 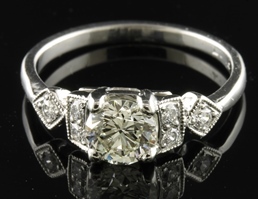 This 14K white gold engagement ring is set with a 6-prong set center round brilliant diamond weighing .54ct. Channel set round accent diamonds give this modern style an eye catching look. Sapphires and diamonds make wonderful companions in a wedding band. Add a touch of vintage flair with this beautiful band. French cut square sapphires and round white diamonds are set in a 18K white gold setting. Delicately detailed with milgrained edging and vintage style engraving, this band is right at home in today's modern world. For those who need to break from the norm, here is a great contemporary style to entice you! Twelve individually bezel set diamonds set in 14K white gold give this band a modern attractive look, and also dazzle with great clarity and very little color. 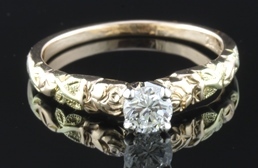 This vintage engagement ring has hand carved, whimsical detailing of flowers and vines along the top of the shank. 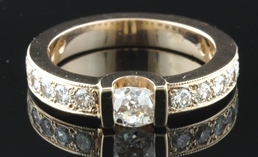 What makes this estate ring truly unique is the use of both 14kt yellow and rose gold. 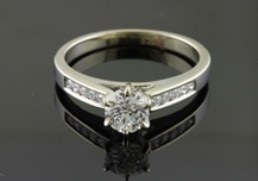 Set with a .40ct diamond in four prongs. 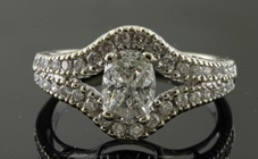 A sweet vintage piece for your sweetheart! 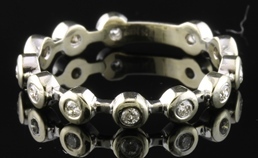 Looking for a rugged ring that you can wear every day and it still looks great after many years? We have the answer! Palladium is strong and durable, a close relative to platinum but more wallet friendly. The raised center of this ring is hammer finished and brushed. 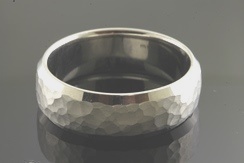 This ring style can be ordered in any metal and any size to fit your needs. Always tough, always looks great! That's the secret of palladium. 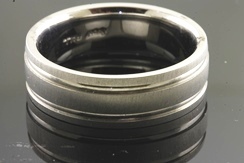 This single groove ring mixes matte and brushed finishes for a modern style. Available in other metal choices and any size for a perfect fit. The eternity band... A statement of love that is continuous for all time. This eternity band is set in 18K yellow gold and holds .36cttw of bright, dazzling diamonds. Show her you will love and care for her for all time! Sleek, clean and modern, the channel band is a favorite of ladies who want fashionable security for their most precious of gems. 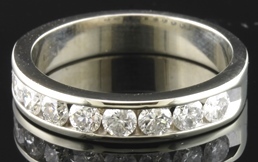 This nine-stone channel wedding band is set with .63cttw of round cut diamonds, snugly set within 14K white gold. The perfect mate for a fantastic engagement ring! 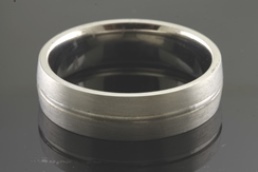 Cast in long-lasting palladium, this double groove ring is a popular choice for the contemporary man or woman. Available to order in your width preference, metal choice, and finish. Engraving services available.